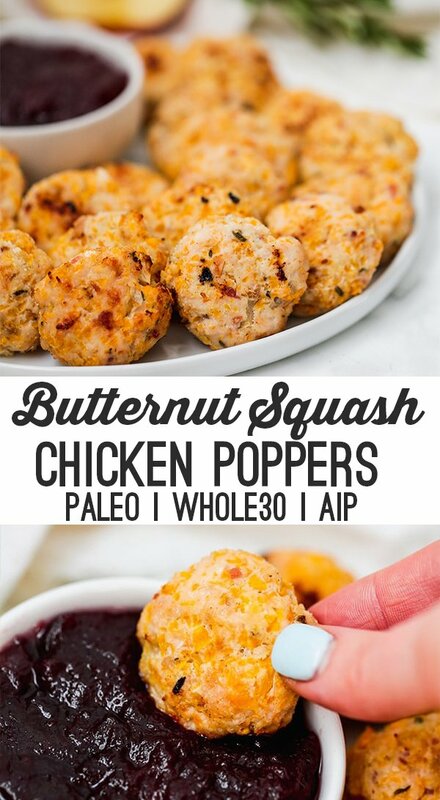 These butternut squash chicken poppers are a tasty and easy autumn dish! It’s paleo, whole30 and AIP. 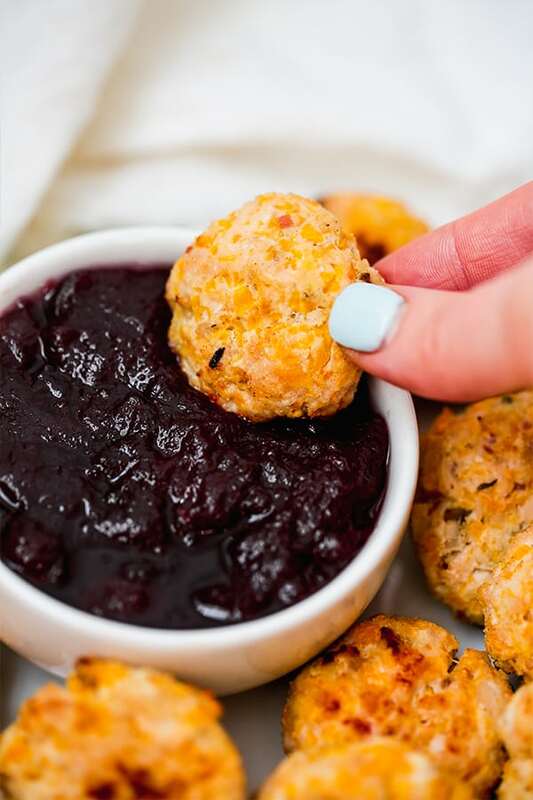 Serve them with cranberry sauce for dipping, and a side of fall vegetables. I never ate butternut squash before I went gluten free. I mean, maybe it snuck in somewhere here or there, but I never really saw the need for a winter squash veggie when I was already eating so much bread. Boy, was I wrong! Now, I look forward to butternut squash season every year and am always sad to see it go in the spring. It’s amazing in soup, it’s makes awesome fries (like these butternut squash fries), and it even tastes great as a binder for these butternut squash chicken poppers! 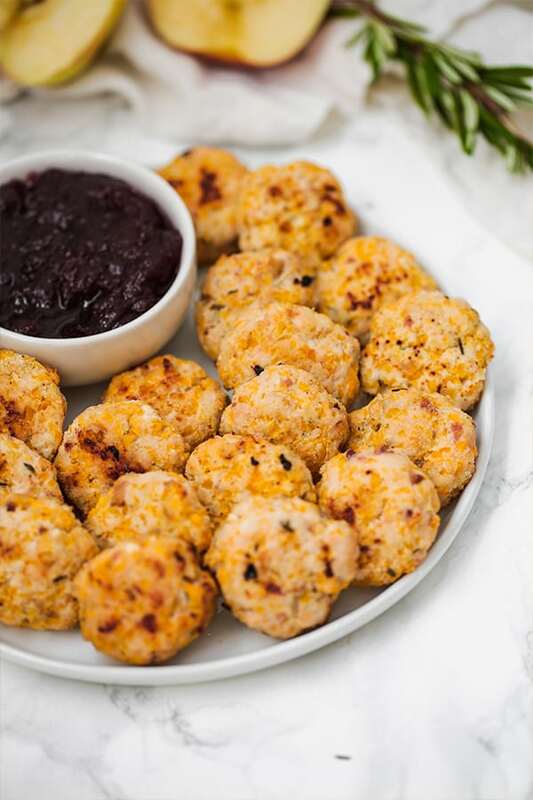 Sweet potato chicken poppers are a reader favorite (and a personal favorite) over here, so why not add a bit more fall flare to them with butternut squash? Not only does add some awesome autumn flavor, but it adds in a new flavor and nutrient profile! Sweet potatoes are a bit of a staple in healthy diets these days, so why not mix it up? If you don’t have ground chicken on hand, you can also use a food processor to grind whole chicken breast. Ground turkey is another great substitute! Bacon adds more of a smokey flavor and cuts some of the sweetness of the other ingredients. However, it’s technically optional. The butternut squash in this recipe is shredded and riced. All you need to do is use a food processor! If you really want to make this a fall dish, serve it with a sugar free cranberry sauce! If not, it tastes great on it’s own. Using a food processor, rice the butternut squash until fine. Remove from the food processor and set aside. Process the bacon in the food processor until finely chopped. Use a large mixing bowl to combine the chopped bacon and ground chicken. Mix the remainder of the ingredients into the chicken mixture and mix well until fully combined. 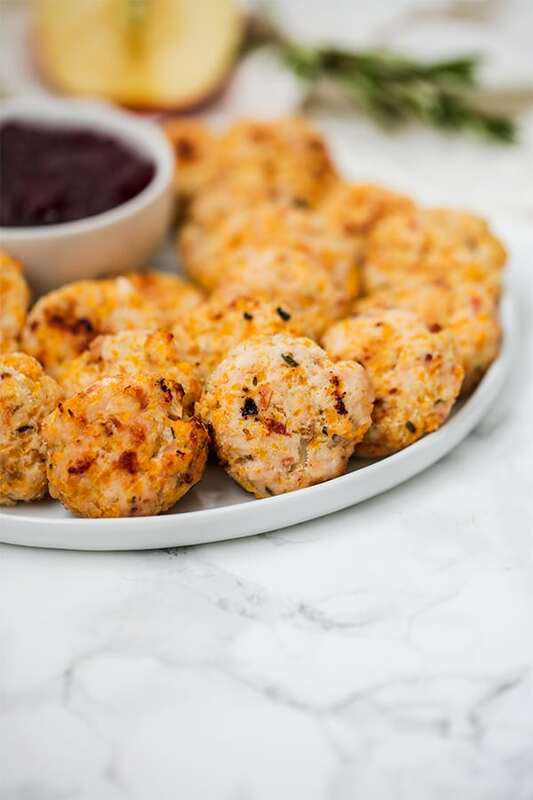 Roll the chicken mixture into small chicken poppers, slightly flattening with the palm of your hand. Place on a baking sheet evenly spaced. Allow to cool and serve by themselves or with a refined sugar-free cranberry sauce (or completely sugar-free for Whole30). Is the bacon cooked or raw ? Is the butternut squash cooked before you rice it or no? We cooked some butternut squash in my pressure cooker last night & would like to make this tomorrow without picking up another squash only to use part of it, can I sub in the cooked squash for the raw riced squash?